 MH Signature Journeys specializes in creating an itinerary around your passions. River and small-ship cruises are a hugely popular way to see and experience the world, up-close and personal. The possibilities are endless. Visit Monet’s home in his beloved village of Giverny, where he created his greatest masterpieces. Taste the products of Bordeaux’s wine country, or the Cape Winelands of South Africa. Don’t just see the world. Taste it. Experience it. Special sailings with extra perks... and only Virtuoso travel advisors can help you book them. Virtuoso Voyages are available only to those who book their cruise travel through a Virtuoso-affiliated travel agency like MH Signature Journeys. The program offers complimentary benefits on the world's finest cruise ships across hundreds of annual departures. Learn more about the Virtuoso Voyages enhanced experiences, then contact us today about upcoming Virtuoso Voyages sailings. Click here for more info on the Virtuoso Voyages 2019-2021 World Cruises & Grand Voyages. Azamara Club Cruises specialize in Destination Immersion so you can experience more on every voyage. Travel through scenic waterways and enjoy prime docking locations on their boutique-style, award-winning ships. Enjoy several inclusive amenities: gratuities, select standard spirits, beers, wine, shuttle service to and from ports (when available), complimentary AzAmazing events on almost all voyages and more. The world is filled with stunning views, and with this new offer, those views can be seen right from your balcony. Share & Save - Book a select voyage by May 31, 2019 and receive 50% off the cruise fare of the second guest. But that's not all. You'll also receive a $500 onboard credit and free unlimited Wi-Fi for one device for the duration of your trip. Travel together, stay connected. Contact us directly for applicable sailings. Additional Virtuoso amenities available on select sailings and are combinable. Celebrate a special event around the world like the Monaco Grand Prix, British Open, Redentore festival in Venice (Festa del Redentore), 75th Anniversary of D-Day, British Open in Portrush, Northern Ireland, Royal Edinburgh Military Tattoo, annular solar eclipse in the Indian Ocean and more. Azamara Club Cruises also specializes in AzAmazing golf cruises around the world through their partnership with PerryGolf. Take a look at our Golf Trips page for more info. Book these and more destinations around the world with MH Signature Journeys. Contact us today to start planning your next journey!